George Washington comes alive in this fascinating activity book that introduces the leader to whom citizens turned again and again- to lead them through eight long years of war, to guide them as they wrote a new Constitution, and to act as the new nation's first executive leader. Children will learn how, shortly after his death in 1799, people began transforming George Washington from a man into a myth. But Washington was a complex individual who, like everyone, had hopes and fears, successes and failures. In his early 20s, for instance,Washington's actions helped plunge Great Britain and France into war. He later fought for liberty and independence, yet owned slaves himself (eventually freeing them in his will). 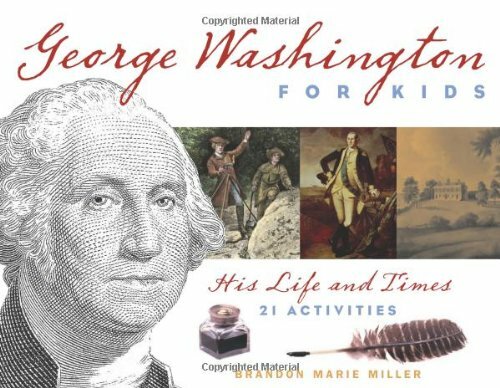 This book weaves a rich tapestry of Washington's life, allowing kids to connect with his story in 21 hands-on projects based on his experiences and the times in which he lived. Children will learn how to tie a cravat, write with a quill pen, follow animal tracks, sew a lady's cap, plant a garden, roll a beeswax candle, play a game of Quoits, and make a replica of Washington's commander-in-chief flag. The text includes a time line, glossary, websites, travel resources, and a reading list for further study.